If you’re thinking about divorce, you have probably wondered how much it’s going to cost. An experienced Tampa divorce lawyer can help you create a case strategy that is smart and cost-effective. In some cases, it may be appropriate for your spouse to cover your lawyer fees and court costs. Although laws in the United States descend from ancient English common law, there are several important differences between American and English jurisprudence. One of these differences is the so-called “American Rule”, which applies to attorney’s fees. In England, the losing party must usually pay the winning side’s lawyer fees. Because there are such close links between the U.S. and England, it’s no surprise many people mistakenly believe the rules regarding attorney’s fees are the same this side of the Atlantic. In fact, the law in the U.S. is just the opposite. Generally, the American Rule dictates that each party is responsible for his or her own lawyer’s fees, regardless of which side prevails in the case. Like any other area of law, however, there are exceptions to this general rule. For example, individual states can deviate from the American Rule by creating exceptions in their statutes. When Does a Spouse Have to Pay? In Florida, Section 61.16 of the Florida Statutes creates a notable exception to the general rule requiring each side to cover his or her respective attorney fees. Specifically, the statute says the courts can order one side to pay the other side’s attorney’s fees in a dissolution of marriage after considering both parties’ financial resources. Courts in Florida can also order one side to pay the other person’s court costs. The statute also says that an at-fault party can’t recover attorney fees from the other party. For example, if a wife must file an enforcement action against a husband for failing to pay his child support, the husband can’t ask the court to order the wife to pay his attorney’s fees. As the noncompliant party, the husband has no legal standing under the statute to ask for attorney’s fees. 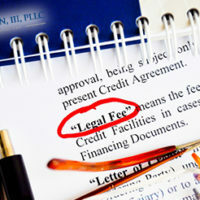 What Factors Make a Court Award Attorney’s Fees? Florida courts generally have broad discretion when it comes to awarding attorney’s fees. In most cases, they will consider awarding one side attorney’s fees when the person can show that the fees are reasonable and that there is an actual need for the award. For example, in a divorce case where one party earns a substantial income and the other party has never worked outside the home, the party with no financial resources may very well be at a disadvantage. In these cases, the court is more likely to order the wage-earning spouse to pay the other spouse’s attorney’s fees. Judges in Florida also frequently order one side to pay the other’s attorney’s fees when it’s clear one side filed a motion simply to harass or badger the other person. The law prohibits parties and their lawyers from filing “frivolous” motions and actions that have no legal merit. In these cases, the “innocent” party should not have to pay to defend a frivolous case. If you have questions about the divorce process in Florida, a Tampa Board-Certified Family Law Specialist can answer your questions and give you peace of mind about your case. Get in touch with a Tampa divorce lawyer today.